Durability is key to life on the farm! 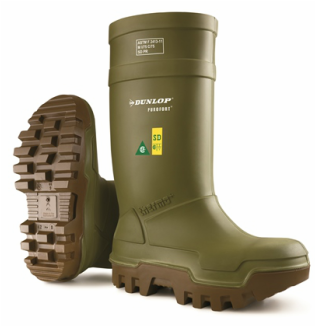 Dunlop Protective Footwear has met the challenge with years of proven experience in the European markets. Dunlop Footwear features a rigid shank which reduces flex points, causing a "rocker" style step, resulting in a boot that lasts 3X longer than a traditional rubber boot. Billions of tiny air bubbles, injected into the polyurethane during manufacturing, makes their boots 35% lighter than traditional boots while still providing excellent insulating characteristics.